Exactly 101 years ago President William Taft signed a bill making Arizona the 48th state to be accepted into the union of these United States of America, thus completing the borders of the contiguous portion of the nation. It was also the birthday of the first woman I ever loved. Marzelle Eiland was born in Junction City, Arkansas to Alton and Eula Eiland. Nineteen years later she would marry Abdella Abraham Ascol, the son of a Syrian immigrant. Over the next 26 years she would give birth to six children, of whom I am the youngest. Unlike my father, my mother knew the blessings of a Christian family. Her parents were strict Baptists who were equally suspicious of the “anti-Christ” papacy of Roman Catholicism and the new-fangled “holy-rollers” of Pentecostalism. She learned to fear God and trust Jesus at an early age and she labored diligently and prayed incessantly to see those same dispositions planted in her children and grandchildren. In so many ways mom had a difficult life that stemmed primarily from a painful marriage. My dad was the son of a Muslim and his early life has all the elements of a Greek tragedy. Many of the patterns of sin that he developed in his youth were not effectively mortified until his final years on earth. These created particular challenges and trials for my mom over the 63 years of their marriage. Mom died in 1994. Only the three oldest of my six children have any personal memories of her. But because of the lasting impact of her life, they all have heard countless stories about her and, together with their thirteen paternal cousins, thank the Lord for her. Every Valentine’s Day I am reminded of the blessings of being born to a godly mother and I pause to reflect on some of the ways her life has helped shape my own. Mom raised six children who, by God’s grace, have experienced His salvation through faith in Christ. Five of us are still in the land of the dying and therefore are still living by faith. Each of us can testify of the unique and common ways that God used mom to shape our lives. Though I am quite sure that the influence of a godly mother exceeds my ability to comprehend fully, here are six specific lessons that I first learned from my mom. She taught me to pray. One of the most vivid memories of my preschool years is being on my knees next to mom as she led us in prayer about a particular trial. Her words were so heartfelt, passionate and personal that I finally opened my eyes and watched her as I listened. It struck me that she was convinced that she was really talking to Somebody and that she was convinced He was listening and that He cared. When my faith has grown faint I have often remembered that holy scene and, through the memory, been encouraged to pray. She taught me to love the Bible. The Bible was an integral part of my mother’s life. She was a Sunday School teacher for as long as I can remember up to her final years. A common sight in our home was mom sitting in her chair with her Bible opened to a passage she was studying. When I moved away to go to school phone calls from mom often included conversations about some text of Scripture. She also included Scripture in her letters to me. Because of her influence, I was well-acquainted with Scripture and had seen its power in my life long before I sat in college classrooms led by professors whose skepticism belittled it and dismissed its authority. She taught me to trust God. Mom’s confidence in God seemed natural to me. Through her intentional instruction as well as her informal explanations about how we would face the future I learned that God is trustworthy. It was her faith in God that led her to continue her pregnancy when I was in her womb. Because she was 44 years old, her doctor encouraged her to have an abortion and offered to help arrange it, citing medical reasons why such a course was advisable. But mom trusted God and refused to end my prenatal life despite her doctor’s counsel. Her confidence in God’s faithfulness made her trust in Him almost reflexive. And it made me want to learn to trust Him in the same way. She taught me to love the church. Looking back I now know that mom had many reasons to be embittered toward the church. There were several unfortunate events that took place in our church during my childhood that I did not learn about until many years later. Mom lived through them, often being treated unjustly, without any animosity that I ever discerned. She loved Christ and she knew that loving Him means loving His bride. And she taught me to love His bride, as well. She taught me to persevere. So many times my mom could have quit and hardly anyone would have blamed her. Her life was hard and there were many opportunities for her to walk away from it. But she kept her vows made to God and determined to lay down her life for her family time after time. God has used her example of tenacious perseverance at strategic moments in my life to encourage me to stay the course. She taught me to love my enemies. I don’t know if mom really had any enemies. She had a way of making even the most cantankerous person love her. Her funeral was a testimony to that fact as people from all walks of life and every social class gathered to pay their respects. Once, when an unknown thief continued to steal my sandwich from my school locker over the course of a semester, mom demonstrated what our Lord means in Matthew 5:44 by her response. I wanted to make a sandwich out of dog food and leave it for the culprit. She wouldn’t let me, and instead, started making two sandwiches—one for me and one for the thief. After a while, the stealing stopped. 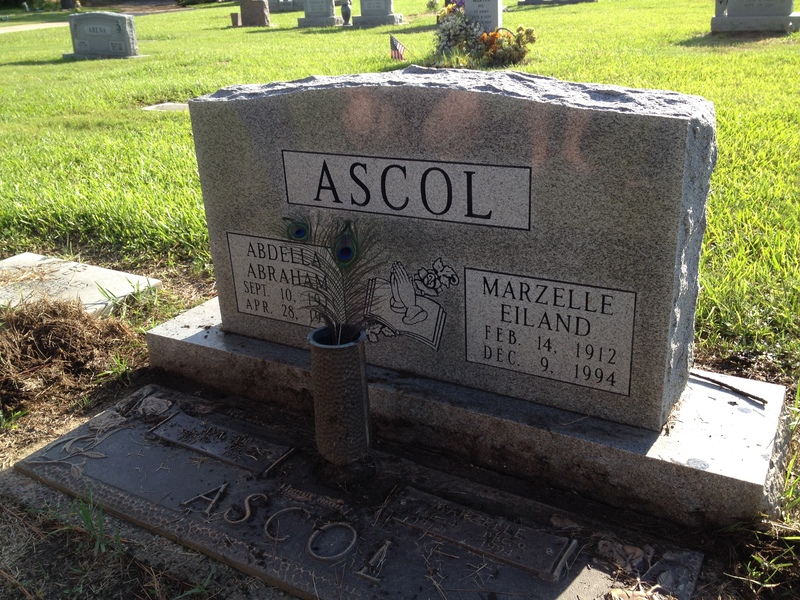 So, today as I pause again to remember the mercies of God manifested to me in the gift of my mother, I thank Him for the life and influence of Marzelle Eiland Ascol. When reflecting on the influence of his mother, Charles Spurgeon made the following observation that resonates with my own heart. It is a reminder to parents everywhere, and especially to mothers, of the powerful impact that a woman who is wholly devoted to God can have on her children. I am sure that, in my early youth, no teaching ever made such an impression upon my mind as the instruction of my mother; neither can I conceive that, to any child, there can be one who will have such influence over the young heart as the mother who has so tenderly cared for her offspring. A man with a soul so dead as not to be moved by the sacred name ‘mother’ is creation’s blot. Never could it be possible for any man to estimate what he owes to a godly mother. Certainly I have not the powers of speech with which to set forth my valuation of the choice blessing which the Lord bestowed upon me in making me the son of one who prayed for me, and prayed with me.